The spot gold price continued to extends its bullish trend once again yesterday ending the gold trading session as a narrow spread up candle with a small wick to the upper body which tested the $1296.05 price point but just failed to attack the $1300 per ounce level which the gold market is now eagerly awaiting. 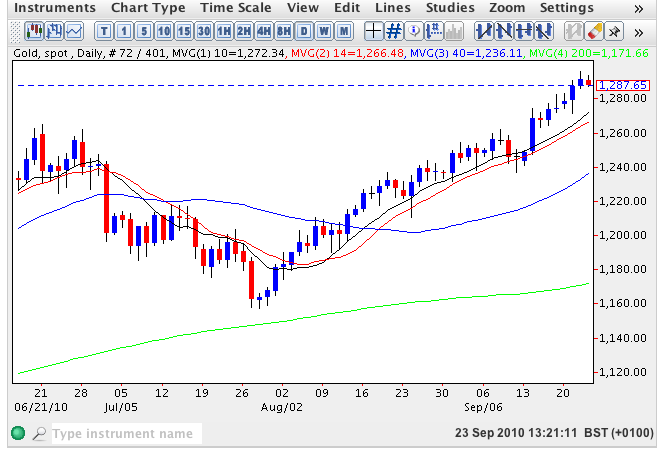 Yesterday’s move higher made it a straight 8 days of gains for the precious metal, moving well above the short term moving averages, which are continuing to provide excellent support to the longer term trend. Following Tuesday’s FOMC meeting gold received a further boost on the news that the FED are fully prepared to implement a further bout of quantitative easing, which has now been delightfully christened the QE2. In addition, and as a result, investors are now seeking safe havens and having apparently abandoned the US dollar are increasingly looking to gold as the ultimate protection against all eventualities – inflation, deflation or stagnation. With both the technical and fundamental drivers now firmly moving in tandem, the long term outlook for spot gold remains firmly bullish and our target for Q1 2011 remains $1500 per ounce which we feel is a realistic target for the precious metal.